Christine enjoys her work and has helped many people achieve better health, improved function and a better quality of life. This is her passion. She has many years experience in massage. Her background also covers strength and conditioning, personal training and more recently, yoga training. Christine has worked with all types of people, from elite athletes to the disabled, youth and the aged. 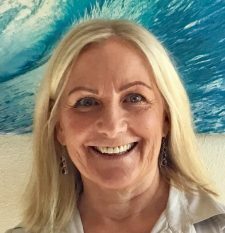 Christine believes in the body’s capacity to heal itself under the right conditions and using safe and proven approaches. Many years ago, having this mindset, she encountered David Freeland. At the time, David was a Chinese Medicine student who was studying at The Australian College of Natural Therapies in Sydney. He was conducting a Chinese Massage introductory course and Christine attended this course. This experience greatly influenced her path into remedial massage. Remedial Massage and exercise therapy work beautifully together. With this combination of care she consistently observes people reshape their posture, emotional state and ultimately their life. It’s something you’ve got to experience to appreciate! Seeking help for an acute episode of back pain years ago led Christine to become a massage therapist. She was assisted greatly through Steve Lockhart Myotherapy (SLM) massage and subsequently trained intensively to become a SLM therapist herself. SLM includes deep-tissue massage, acupressure and myofascial release and is very effective in resolving many body pain syndromes. Having a Diploma Qualification in Remedial Massage also means that Christine has a broad coverage with health fund providers as well as being registered as a Work Cover remedial massage therapist. As a qualified Neuro-linguistic Programming (NLP) Master Practitioner she has a special interest in a client’s emotional wellbeing. NLP is about effective communication, living every day with passion and adopting the mindset of a winner. This together with her massage expertise puts Christine in great stead to work on the “whole” person, assisting not only the physical but also the important mental and emotional dimensions of health. Copyright © Southpoint Health Clinic 2017. All rights reserved.